Get action packed for adventure and go there in style with Nitro. Nitro’s generous 102" widebodies are big on living and storage space. 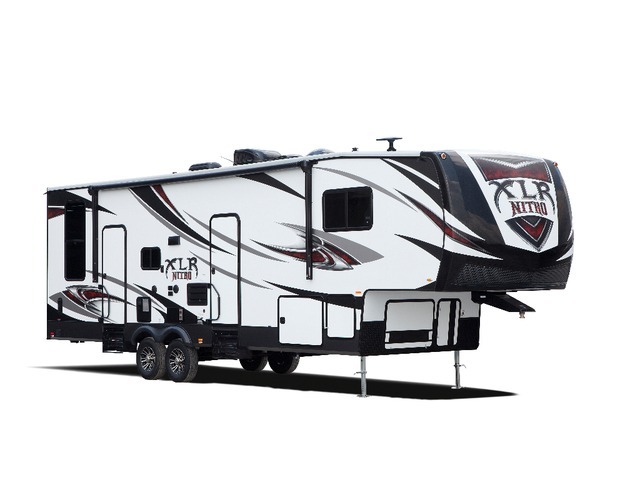 Built tough with rich cherry cabinetry Nitro is the perfect blend of sport and leisure living. Go Big. Go Bold. Go XLR Nitro! Dry Weight 10,259 lbs Pin Weight 2,295 lbs Overall Length 32' 8"
Dry Weight 12,454 lbs Pin Weight 2,520 lbs Overall Length 41' 1"
Dry Weight 12,569 lbs Pin Weight 2,525 lbs Overall Length 42' 9"
Dry Weight 13,299 lbs Pin Weight 2,810 lbs Overall Length 43' 8"
Dry Weight 12,229 lbs Hitch Weight 2,465 lbs Overall Length 39' 5"
Dry Weight 12,859 lbs Pin Weight 2,780 lbs Overall Length 41' 4"